← Who finished the paper edit? This guy. Good Characters, Sporting Events, and where the hell did that weekend go? So, another Monday, and the final weeks until Babytime are upon us. Tecccchnically it’s a long weekend, but I had a half-day last week so I figure I’ve already taken my day off. Last week also contained the bizarre moment of me turning down a day of drinking (!) as it would have fallen in this new child-rearing epoch. I’m pretty sure I’m going to enjoy being a dad more anyway (but don’t tell my mates that). I do remember two very productive things that I did, namely watching the Formula One and Rugby League Final back to back (so productive! YEAH!). They both got me thinking about characters, as each had some fairly powerful examples. The Formula One was a wet race in Suzuka, with the safety car and stoppages due to the unsafe conditions. Adrian Sutil spun and put his car into the wall, and then a couple of laps later one of the backmarkers, a young frenchman named Jules Bianchi, spun off the track at the same spot. Right into the back of the crane that was removing Sutil’s car. This is an absolute tragedy, as crane’s don’t cushion impacts like the barriers do, and Bianchi was taken to hospital for emergency surgery for head injuries. No champagne podium, no wild celebrations, just shock all round. I really hope the guy is okay and makes a full recovery (not looking good). Unthinkable tragedies and how people respond to them captivate an audience, and we invest so much more in the characters involved. NOTE: this is my armchair opinion, and I have a readership of about twelve anyway, so go and sue somebody else for defamation, FIA. After the F1, the Rugby League Grand Final comes rocking along, and once again my thoughts zipped straight to writing. You’ve got the Bulldogs VS the Rabbitohs, and the rabbits have an excellent backstory. The League was stuffed around a lot in the last twenty years, with Superleagues and teams being axed to create some rich idiots’ visions of the way it ought to be. Kind of why I stopped bothering to watch it (that and my team won a premiership, so I figured why not leave on a high?). 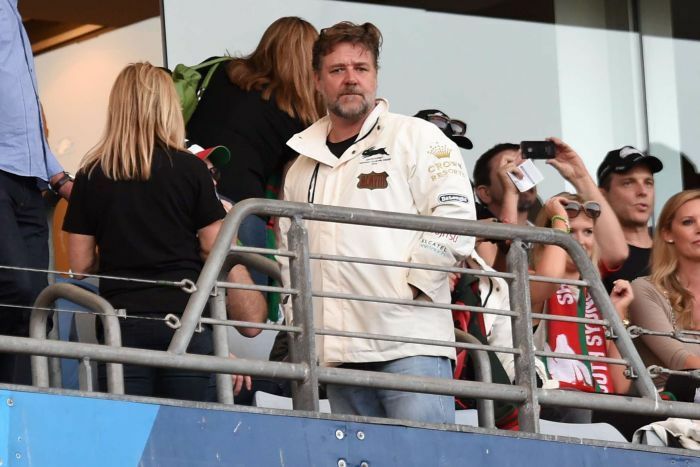 The Rabbits were out of the competition at one point, but RUSSELL FREAKING CROWE bought them. I’m not even kidding, he up and bought the team with a businessman pal of his, got a lawyer to work pro-bono (he was a Rabbits supporter too) against the League, and forty three years after they last won anything they were fighting for the premiership. In front of a record crowd no less. So besides decapitating as Maximus, singing his black little heart out as Javert (or trying to), and making ho-hum music as frontman of TOFOG, Russell Crowe stood at the sidelines last night and absolutely rocked his performance as the benevolent champion of the Bunnies. His facial expression throughout was one of a man overflowing with emotion, but too much of a hard-arse to let it show. Slight gleam in either eye, almost imperceptible smile. This was a character I could get behind. Have a compelling backstory for your characters. …but also give them a vision, a direction to strive in. …and make sure they have the backbone to ignore all obstacles. The other epic character in proceedings was Sam Burgess, a huge blonde shorn viking of a guy, who had his cheekbone broken in a headclash in the opening minute, AND PLAYED FOR THE OTHER EIGHTY MINUTES. So let’s get this straight: you’ve got a broken face, but you’re going to play a contact sport, continually hitting your body into other giant dudes, and you’ve got blood streaming out of your mouth and nose, and your cheek is now the size of a footlong sub, and your team doctors are telling you to get off the field, but you’re… You’re smashing that guy, look at him fly, jeebus. And you’ve got the ball, and you’re running around and… WHAT THE HELL ARE YOU DOING? I love this kind of thing. I think it’s all about expectations, we should expect that the character, be it Russell Crowe with his impossible team revival dreams, or Sam with his broken-meat-bag face, will fail. Surely they’re going to fail, these odds are insurmountable. And then they should win. That’s the character you want to watch. The Rabbitohs did win the Premiership by the way, with a huge landslide of Tries towards the end. Question Time! What people have you seen in real life / sport that you think make epic characters, and why? This entry was posted in Writing and tagged characterisation, characters, fiction, Formula One, Rugby League, Russell Crowe, Sport, Writing. Bookmark the permalink. 5 Responses to Good Characters, Sporting Events, and where the hell did that weekend go? Russell Crowe. Sigh. Wait, what was the question? Seriously, though. In sports, for me it’s Mariano Rivera, closer for the NY Yankees. A giant on the diamond. Cool in the most stressful circumstances. Famous for breaking bats with his pitches. Off the diamond, a soft-spoken, quiet guy, devoted Christian, and family man. Greatness without conceit. Or maybe I just like zombies. Plus he could break a bat on a zombie’s head. Evgeni Plushenko. First, ice skating often uses film scores, and there’s always a narrative. Second, the whole Mother Russia is Depending on Your Win complex—can you spell the pressure? Third, Evgeni’s entire career, from child prodigy to the 2014 Sochi shocker, was basically made for the movies: protagonist gets beaten down as a kid, learns to get up again. Redeems self once, twice, infinite number of times, but when the final showdown/last performance approached, he backed out due to injury. Was it the right choice? A terrible one? Only the readers can decide. Oo, that’s brilliant. I’m thinking I need to develop some more performance pressure plotlines around one of the characters in my current WIP. There’s a lot of drama to be squeezed into (out of?) live performances in fiction, and it’d be a nice change from my usual fare of swashbuckling and intrigue.